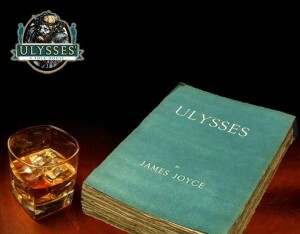 Our friends at Ulysses’ Folk House always throw a huge celebration on Bloomsday. Not only because they are named after James Joyce’s epic novel in which Bloomsday takes place, but also because it is their anniversary. 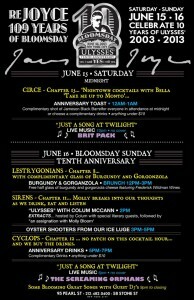 This year’s Bloomsday at Ulysses’ celebrates their 10th anniversary. Offering a complimentary glass of burgundy and a chunk of gorgonzola cheese, so you can nosh like Leopold Bloom himself in Chapter 8. Celebrated Irish author Colum McCann will be the master of ceremonies for readings from the great book by a pantheon of literary figures. In honor of Ulysses’ Folk House’s ten year anniversary, and the part in Chapter 12 where many rounds of drink are ordered, the owners of Ulysses’ invites you to have one with them. Four Irish sisters will sing the classics in their guise as the band Screaming Orphans. Guest DJs will be working the wax in a manner entirely consistent with Dublin in June 1904. 95 Pearl St. / 58 Stone St.